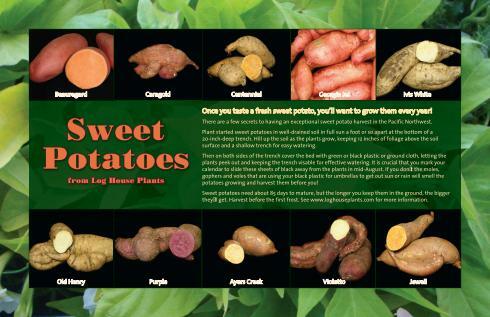 Once you taste a fresh sweet potato, you’ll want to grow them every year! There are a few secrets to having an exceptional sweet potato harvest in the Pacific Northwest. Plant started sweet potatoes in well-drained soil in full sun a foot or so apart at the bottom of a 20-inch-deep trench. Hill up the soil as the plants grow, keeping 12 inches of foliage above the soil surface and a shallow trench for easy watering. Then on both sides of the trench cover the bed with green or black plastic or ground cloth, letting the plants peek out and keeping the trench visable for effective watering. It is crucial that you mark your calendar to slide these sheets of black away from the plants in mid-August. If you don’t the moles, gophers and voles that are using your black plastic for umbrellas to get out sun or rain will smell the potatoes growing and harvest them before you! Sweet potatoes need about 85 days to mature, but the longer you keep them in the ground, the bigger they’ll get. Harvest before the first frost.